The Merry Masons have once again won the Trades House Curling Trophy after a series of hard fought games. The Incorporation of Hammermen were the team that we faced in the final and that was a particularly difficult game to win, but win we did. The team was slightly different from the last few years as Brian Evans was not available to take his normal place in the team, his replacement was James Bacon, the 15 year old grandson of David and Jan Dobson. Young James played a stormer and was most popular with the other members of the team. Jame’s mother, Louise, was quick to acquire Jame’s bottle of wine before he was able to celebrate his success with a wee beverage. The other members of the team were Doug Kerr as Skip and he was supported by Iain Smith, Gavin Smith and young James Bacon. It is likely that James will have the honour of being the youngest winner’s name to be engraved on the beautiful cigar box which is the trophy so sought after by the curlers of the Trades House. 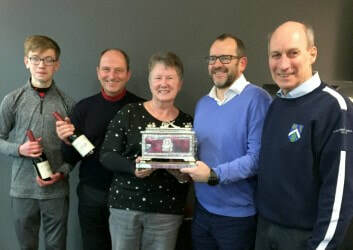 Helen Burton presented the trophy to the Merry Masons winning team.